Many tourism industry leaders have decided to boycott Sri Lanka Tourism Awards ceremony this year, as President Maithripala Sirisena has been invited as the Chief Guest. 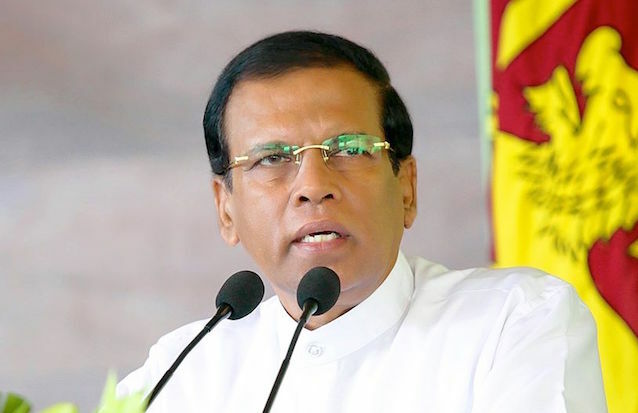 They have expressed disgust at the Sri Lanka Tourism Development Authority (SLTDA) has invited Sirisena, the man who is responsible for ruining the tourism industry this year by engineering a constitutional coup and a political crisis, as the Chief Guest of the event. Sri Lanka Tourism Awards ceremony is scheduled to take place tomorrow (06) at Shangri-La Hotel, Colombo. Multiple hotel chains have decided to not stand up if and when their names are announced as award winners in the event Sirisena attends the ceremony as the chief guest. When the event was first planed in October the SLTDA decided to invite ousted Prime Minister Ranil Wickremesinghe as the Chief Guest. In the aftermath of the constitutional crisis on October 26, the SLTDA changed its decision opted to invite British High Commissioner James Dauris as the Chief Guest of the event. Colombo Telegraph learns that SLTDA Director General Upali Ratnayake has then decided to invite Sirisena, the man who drove the tourism industry to the ground this year by triggering a political turmoil, as the Chief Guest of the event. As a result of the downfall of the tourism industry last month, over 300,000 jobs have been affected and all tourism related industries have experienced a steep drop in their revenue. The decision has now sparked a serious controversy in the tourism industry with tourism industry leaders decided to express their objections over the decision to invite Sirisena as the Chief Guest. So now what will he set fire to now ? What has the big business tourism industry to say about Central Bank Bondscam by Ranil who should have been impeached when the PCOI Report into the Bondscam at Central Bank came out by Sira. Better late than never! The Culture of impunity and immunity for financial crimes and hate crimes by corrupt politicians, led by Bondscam Ranil and his partner in crime Mahinda Jarapassa and family and cronies must end. RTIC also needs to ask Central bank of Sri Lanka to release the info. on the international sovereign bond traders who hold 55% of Lanka’s External debt that is crashing the rupee. Bond scams – internal and external are the cause of Lanka’s debt trap and crashing economy and how IMF-WB puts small countries into their so-called Middle Income Country Debt trap. 55% of Laka’s foreign debt is owned by US links soveriegn bond traders who are crashing the rupee The precise information on this should be revealed as they want to loot and asset strip Lanka with the help of Bondscam Ranil and his Royal mafia who looted the central bank. Bond-scam nothing compare to Hedging agreements and other thefts by previous governments.bond-scam loss is approximately 11 billion rupees(US$ 65 million). Dead on Don, but Trump land Peace Corp. bots are trying to take you down. 66 No votes – you have scored big! “No-one seems to be spooked by the ongoing political crisis, and in a way, people seem pretty happy, comfortable and more relieved without a government, D. H. Wijewardene, president of Sri Lanka Institute of Architects (SLIA) said on Tuesday. However, when The Island Financial Review asked him whether he seriously thought that investors also won’t be spooked when there is no government, he said, “The current crisis and the way the businesses and the people react to it shows that a government is not needed to a certain extent. You see, businesses can’t let the crisis dishearten them as they have to move forward, and the general public just take a look at what’s going and then they simply go about their daily business. Sri Lanka is a country with enough resources which are yet to be tapped in full. The country is not governed by the ‘correct’ people. I believe that the ‘correct’ people will come at the ‘correct’ time to take over the administration. We need to replace old faces in parliament with young blood. People’s attitude towards politicians is changing. Now they don’t give politicians unnecessary honour and veneration as they used to. This crisis is not the end of the road. The citizens are looking after themselves without the support of the authorities who are mandated to do so”, he said. Architect Wijewardene made these comments at an event held at Galadari Colombo where SLIA announced the “A 19- The Exhibition” and other events of the 37th Annual Sessions which are scheduled to be held from February 20-24, 2019 at the BMICH Colombo. Good news, ballige putha Sirisena has made it clear, if he would have been pushed to wall, he would resign. We would like him to train for self-immolation tactics, by contating MONK WIRATHU from Myanmar. Quoted from Tweet_ Manoganesen (Below). The SL Government is enjoying the full amount of the Bound Scam. If at all only two installments were paid back. Please barer in mind it is not only the big hotels that suffer the impact of the of this selfish move by the president, thousands of small & medium scale suppliers and service providers are victims too. There WAS NO BOND SCAM. It’s the illiterate SL PUBLIC THAT THINK SO. Arjuna Mahendran is a TOP professional banker /economist. Btw he was born in the USA. And currently is a Singaporean Citizen. A country like no other, sorry Sri Lanka you lost that tag, with SO SRILANKA orchestrated by none other than another true Sri Lankan rolling stone that gathers no moss, RANIL DE SILVA. Look him up with pictures that tell the the story of his sordid life..Sl politicians flock to to bank their ill gained cash in Singapore /HK/Dubai. If you wanted to be popular you have chosen the wrong to voice your opinions. See how few have liked what you said, while a huge number have not liked it. However, you have made some valid observations. On the other hand, the non-violent strategies that are being used are the right ones. Are you sure such report exists? It appears you are have some knowledge of the Bondscam. Will you please tell us how did the scammers swindled supposed to be large sums of money from ever vigilant Central Bank, Treasury, …………………………? Could you provide us with a computation of total amount robbed. If a anyone who does indulge in mugging should take up Bondscam which looks and sounds much easier than mugging. Don, you are ill. Get some medication. This is Sri Lankan style of addressing an issue. This forum is about the president being the chief guest at Tourism Award and not of any other issues. The SL politics thrive with people of Don Stanley calibre. 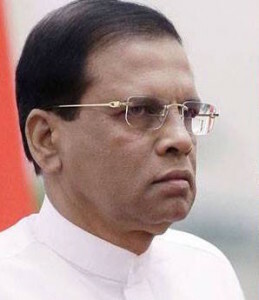 President Maithripala Sirisena has said that he would resign from Presidency after making a State of the Nation Address if he was pushed to the wall, MP Mano Ganeshan said. According to the MP, the President has said this during the meeting which was held with United National Front (UNF) party leaders Monday night. “The President said that if pushed to the wall, he will make a State of the Nation Address, resign from Presidency and get back to his Polonnaruwa farms,” he said in a tweet. Sirisena, what a relief!. Can you do that this week. The land is burning now. Do what Siri Sanga Bo King did. We are delighted to hear this Great news!!! People of Sri Lanka will celebrate it with Milk Rice and lighting crackers all over the country if he does so. This man is a Nail and a Curse in our country!!! Amarasiri, he should change his mane to Paithyarala (mad peasant) Sirisena. So, you would like to confer additional Title of Paithyarala (mad peasant)? But he is the President. Shouldn’t we confer the title, Paithya-Janathipathi or Pissu-Janathipathi, the late Dr. N M Perera warned us about in 1878? MS get out this Friday – it is the 1st Friday of the 12th month of the year 2018. Be careful, your villagers will stone you to …..
amarasiri,what i am worried is whether if he resigns,then will we have to have a presidential election?If so with sirisena’s support to mahinda,a rajapakshe/puppet can become the president.However the presidency could be abolished by two thirds majority i believe.That is the safest route to take. It’s nice to have some exhilarating slogans to shout, but the route that we take has to be rationally marked out by somebody having the intelligence, the know how, and the honesty to guide our actions. What is of paramount importance is making sure that the average voter learns a lesson that he will remember for some time: that seemingly attractive courses of action which are constantly getting selected are not safe. That there are many pitfalls. Most of us reading these articles know well enough the roads to reject; but we are seriously guilty of one crime. We do not have sufficient respect for the common man who has to be educated by us. Instead, we, who have been favoured with a reasonable education keep insulting the villager. I’m glad to see that My3 is now being condemned more for his wrong actions than for his background. We must do our bit for him. Let’s agitate for Sri Lankan Airlines to purchase all his produce at a fair price. The guy has become a raving lunatic, but I can’t help feeling sorry for him. He was trying to hold on to some simple village values that he holds sacred, but somewhere down the line he began to imagine that he was a man selected to do heroic things. He isn’t, and he just doesn’t understand how the world has changed. Do I? Possibly not. We must try to make sure that this doesn’t lead to real tragedy. and sell it to sri lankan airlines as its sole supplier. Present Sirisena has now set fire to the country’s economy, boycotting this occasion does make scene. Sirisena is very very close to be impeached. Once it is done, MaRa and Pohottuwa will evaporate into nothing. Wish it was himself ! I am sure that is the unanimous wish of a 21 million populace !!! He had already set fire to the sri lankan economy and democracy. So silly to make matters adolescent, relevant to national politics? Well it’s apparent, to whose head he’s already set fire. Heads in blaze, struggling now grabbling every chance to belittle this man. People confident as he promised never to make him again to the position held through deception. Everybody knows what he has set fir to. The precedents daughter had written how her father set fire to his father’s paddy field now he has set fire to the country’s economy, boycotting this occasion does make scene. Looks like setting fire to things while this kalakanniya is upset is a natural trait, going by punchi doo’s words. He sure has set the country in fire since October 26. His tantrums have gone worse since then. He has endangered the present and future of over 20 million people of a country he says “he loves dearly” How long will this madness go? Not only is he a Kla-Kanniya, he is also a Rata-Kanniya, destroyer of the Country. Our own Niro, courtesy of the JR presidential constition, where we have a madman as the president. The daughter was lucky that she was born before his balls started dissolving. Now Sirisena is like a kid with a box of matches, and he started by lighting Mahinda’s balls. Now Mahinda is screaming in pain. The blind cannot see at all. Colour blind people see black, various shades of grey, and white – as far as I know. Most animals are colour blind. If, in any species, the male has gorgeous colours, that will be an indication that that those birds, fish, and must be a handful of mammals, see many colours. Bees are said to see colours which we cannot. But they may soon be extinct, and if so millions of humans (who have over-populated the world) will soon be extinct, since most of the plants that we depend on for food need “honey-flies” for pollination. When people get in to “medical talk” I opt out. I never studied Biology and am averse to all that dissection of our bodies. However, I realise that science makes sense, and that any rational person ought to espouse explanations base on evolution than all the religious clap-trap that is popular. Sorry, Jerel, for responding so solemnly to your banter! Sirisena was not such a bad guy; he’s now a lunatic. Protests in black will be decent and will help us relieve the tensions within us. My fear is that “blind” violence will break out on the streets. Few months back we were shown skeletons tumbling out of the tourism industry cupboards. Kandyan Wedding Tours etc. The then Tourism Minister tried to lock the cupboard. Is this boycott demand a means to portray the skeletons as biodegradable stuff and unreal? The Director General of SLTDA is a spineless idiot to invite the the man who screwed up the whole industry to be the chief guest. He should be fired on the 7th. This brings another incident to mu mind. Recent award ceremony for artistes had Duminda Dissanayake (DD) and Udaya Gammanpila (UG) to give award to the winners. Two award winners refused to receive their awards from them and wanted Sriyantha Mendis (SM) (actor) who was there to give it to them. DD and UG are known politicians of Mahinda-Sirisena side, but SM is a one of the slaves (Wahala as said by Sirisena) of Mahinda. It would have been better to receive the award from DD or UG. The beauty of the Bond Scam was that Mr. Clean appointed to power by the courtesy of the masses who obliged to the call to vote MY3 made a windfall from the wilderness to the PM seat and in 40 days without temptation swindles the Central Bank surpassing MR in one go, like no other. Cuda Fernando….. do you have thing called moral in you. Do not mix up politics with the occasion. Your upbringing is on display and reflect badly on your parents. There is no winning and loosing here. Are you playing the role of a cheer leader or a responsible citizen of SL? A dog may have bitten you but would you bite the DOG? Disgusting attitude. Two wrongs does not make one right. Check your emotions and cheap popularity and do not put on a display of your upbringing. People will discard the President at all public events , as his low pedigree personality, has not been approved by the General public, Hence the boycott. (1) How much Sri Lanka Airways, Sri Lanka Catering Services and Mihin Lanka during Rajapaksa’s dispensation? These institutions were managed by Rajapaksa’s brother in law whose qualification is just GCE(O). (2) Rajapaksa family was playing ducks and drakes with public funds/resources during their dictatorial rule. The Rajapaksa family built a Memorial for their father at state expense. It cost Rs.90 million and they have no intention of settling the bill. (3) Rajapaksa family were accused of misusing public resources during the presidential election campaign including the use of Sri Lankan Air Force costing $17,273.28 (Rs. 2,278,000.00) of public funds. (4) At the height of his power, more than 250 family members of Mahinda Rajapaksa were working in Temple Trees. (5) The government spent Rs175 ($1.9 billion) on the Hambantota project which finally ended in the hands of the Chinese government because the government had no money to repay the loans. It was a design-build-transfer (turnkey) project. (6) Another white elephant Maththala Airport, named after Mahinda Rajapaksa, lost Rs 5.9 billion a year. It has since been handed over to an Indian Co. The government has spent Rs27.5 billion ($187 million), with loans taken from China. Do you mean that Ranil is trying to screw the wrong Maithri. Just a Theory – Both are Butterflies. Once the honeymoon was over, things began to fall apart. The fake ‘wife’ got jealous of the genuine one (a perfect and honorable lady). Words were exchanged. Things happened. As I have said before, these butterfly relationships are very strong. Emotions like, jealousy, anger, revenge reach 10 + on a scale of 0 to 10. I have seen this happening here in ME. It is also possible that certain new experimental things were tried out by the senior on the inexperienced junior. One thing led to another and love became hatred. You know the rest. Corollary: For the Butterfly, honey is worth more than the whole world. It’s time to boycott all gatherings, if participted by Alibaba, his gang of thieves and that #1 traitor Sirisena. People who voted for those a**holes looking for progress… are now praying to God for bare necessities… while hyena Sirisena laughing off questions!!! Sri Lanka’s tourism industry needs a serious correction. Hotels are so expensive, car rentals are so expensive, massage parlours are so expensive, brothel houses are so expensive……..
I’d rather see other beautfiul places the world has to offer. Like Tahiti, Northern Europe, New Zealand or Africa. I know several Sri Lankans living in Australia who have never been to NZ. But the dumb arses spend twice the money to come to SL and see the same things they’ve seen many times. If traitor Sirisena and criminal Alibaba continue to drag this situation day after day…. citing constitutional loopholes…. Spineless traitor will flee the blessed country within minutes. I hear the desperate cries from the poor… all the way to Siberia. And the traitor sirisena must bear in mind that unlike Siberia, there is no harsh weather conditions in Sri Lanka to prevent gathering of massses. Sirisena should be very careful of the white tigers in Siberia. You should be held accountable for the mess you created. You need to penalized. You should be impeached and also should beliable for the economic crisis you created. You need to be in jail or stoned to death. I UNDERSTAND NOT ONLY TOURISTS BUT LOT OF TAMILS FROM LONDON,GERMANY,FRANCE,SWISS AND CANADA ALSO HAVE POSTPONED THEIR VACATION TRIP TO SRILANKA EXPECTING TROUBLE AND ILL TREATMENT from police and armed forces who most of them are PRO-MAHIND and will not carry out orders from MY3 if the situation go out of control under MAHINDA AS PM. The House of Commons finds Her Majesty’s Government guilty of contempt to the Parliament .In Sri Lanka the actions of the President and the Government he appointed joking just the opposite . This is the time to stay out of gatherings graced by politicians. Even some one participate should never accept any honors from theses corrupt rouges in white garb. Man who set fire to his father’s paddy field is capable of setting fire to the whole country. This type of men with inferiority complex should never be allowed to lead the country in future. Many people know how he treated educated officials when he was a minister. Tourism industry full of scoundrel s just to put cash into their pockets & look after their families aka SANATH UKWATTE scum bag. Lakshmi Zjeganathan worked st hemas for many years he kept her on due to her close relationship with Mangala as she worked for ms while he was finance minister & held the balls. They ll all turn up @ today’s function. Majority of SL bussiness leaders as they think of themselves have no boundaries! It is a landmark decision by the Tourism Industry to boycott the awarding ceremony in protest of President Sirisena being the chief guest. This is indeed a good move to teach the politicians a bloody good lesson. The tourism industry is the emerging segment to boost foreign exchange of our country. If a country’s president can’t understand this simple logic he is not at all suitable to hold such a responsible position. And he deserves this treatment and more. The retail segment is the other most important segment that is marred by this constitutional coup. Retail segment plays a vital role in the country’s economy. There are two seasons in a year, Aluth Avuruda and XMAS SEASON. By unleashing a constitutional coup President Sirisena entirely ruined the X’MAS season. All wholesalers and retail businessman have already invested huge sums of money to import commodities for the season which is totally hampered. This man Sirisena, the man without a vision but warming up his cushion seat is a burden to the country. If we continue to allow him to proceed he will destroy the country for good. If the tourism industry decides to boycott the awards ceremony. What awards for tourism sector. Useless hotels & industry folk. All the big guns only know to travel the world & spend money on crap promotions like SO SRILANKA. Done by a pukka crook RANIL DE SILVA. All he did was force Senanayake to go to London to attend WTM. Abbas Esufally of Hemas & R DE S were just entertaining the bloody joker. It is really NOT right,or ethical to Use nicknames for the President, He has used the powers he get from JRJ constitution. Do people use derogatory statements to Ranil W ,for a Person who aggreed with Prabakaran to let govern part of the country and now daylight robbing the central bank ,Postponnig local elections ,use democrazy to cover up 3 1/2 ,years mis deeds, Planning to divide country into 9 segments ??? Comparatively Pres. has done acted CONSTITUTIONALLY The JR J , Planned !!! A man with this type of demented mindset cannot continue for long as the President of a country. He has to either be sent to Angoda or jail – that is for sure. So, if any business people have any qualms about the risks of going against the President, I am sure there is nothing to worry about. Just be guided by your conscience. The Frontline View: According to R. K. Radhakrishnan, the Colombo correspondent of Frontline magazine, one of India’s most respected media institutions, the happenings were like this. On 26/10 MR was invited to come by MS and the PM post offered to him on a take-it-or-leave-it basis. MR was surprised by the suddenness of the offer but accepted. But when Basil heard of it, he was livid with anger. But what MS did not anticipate was the high level of international pressure. No country has recognized the new government with only China endorsing it but that too mildly. During the backroom activities MR and RW maintained contact communicating several times a day with each other. Radhakrishnan says, in 50 years of involvement in politics, the two had maintained ‘a level of civility’ with each other. Radhakrishnan says, the people are against the way the operation was carried out. He points out a poster held by a middle aged woman at the protest site, that says, “I am not here for Ranil. I am here for democracy and good governance”. she is echoing what I feel too. All the foregoing is very interesting and enlightening . Everyone is entitled to their opinions. But he HAS to be impeached!